NOTE: This is the website for the 2nd (2012) edition of this book. If you have the 1st (2007), Chinese or Italian editions, go here. The Internet is bigger and better than what a mere browser allows. Webbots, Spiders, and Screen Scrapers is for developers and business managers looking to unlock the competitive advantages of nontraditional online approaches. The book first outlines the deficiencies of browsers, and then explains how these deficiencies can be exploited in the design and deployment of task-specific webbots. Review what's in the book and read sample chapters. Get the tools for writing webbots and spiders. Get addresses of test "targets"
See the pages "targeted" by the examples in the book. Tell me what you're thinking at my website. Why read Webbots, Spiders and Screen Scrapers? 1. Gain a buttom-up understanding of what webbots are, how they're developed, and things to watch out for. 4. Discover how PHP/CURL facilitates advanced file downloads, cookie management and more. 6. 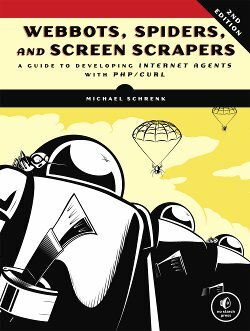 Learn how to leverage WebbotsSpidersScreenScraper_Libraries, the common set of libraries that the book uses to make writing webbots easy. 7. Learn from the author's 11 year career of writing webbots and spiders.